The Rias Baixas wine region is located in the autonomous community of Galicia in north-west Spain. It is best known for its white wines made from the Albariño variety of grape. As far as the history of this particular wine region is concerned, it is thought that the Cistercian monks from the Monastery of Armenteira were responsible for growing the first grapes in the 12th century. 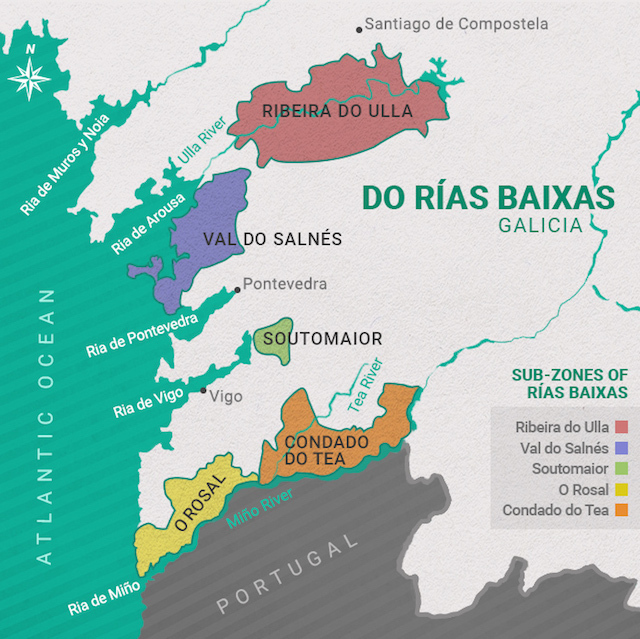 Rias Baixas achieved the official status as a DO (Denominacion de Origen) in the late 1980s, upgrading from the earlier acquired Denominaction Especifica Albariño status awarded at the start of 1980. Val do Salnés is on the lower banks of the Umia river close to Cambados town. The soil mainly consists of rocks and the grapes grow on vines on both sides and the flat floor of the valley. O Rosal is further south and runs along the Portuguese border at the river Miño as far as Tui town. The banks of the river are terraced with vineyards and the soil in the area is made up of broken pieces of rock. Condado do Tea lies in the west and runs from Tui up to Riveiro along the Miño valley. The soil here consists of slate and granite and there are several small rivers running through the valleys. Soutomaior is a sub zone which lies south of Pontevedra city. Although covered in granite the soils here are sandy and light. Ribera de Ulla is the most newly acquired of the sub zones. This area with its alluvial soil was incorporated into the Rias Baixas wine region in the year 2000 and runs north of the city of Pontevedra. The Rias Baixas wine region has an Atlantic climate with a high rainfall compared to other areas of Spain and a regular sea fog. The temperature in the summer time does not usually go above 30ºC, falling to around 0ºC during the winter months. Of the five sub zones, Ribera do Ulla and Val do Salnés are the coldest as they are nearer to the coast than the others. The vineyards sometimes experience problems with strong winds especially when accompanied by frost and hailstones. 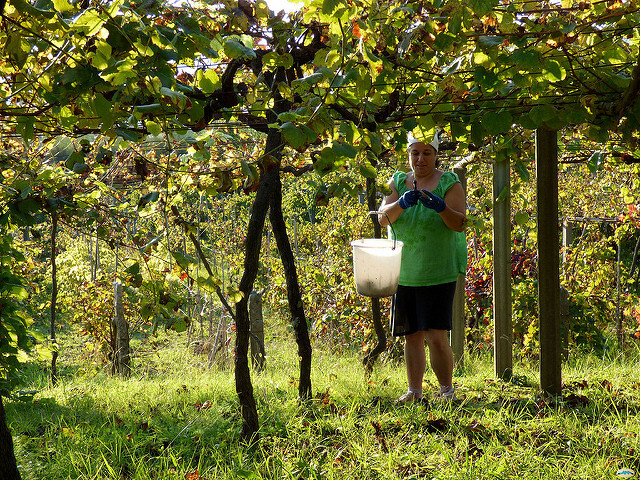 There are twelve grapes grown in the Rias Baixas wine region which are authorised by the regulatory Council, but the Albariño grape, which is a white variety accounts for over 90 percent of all planted vines. 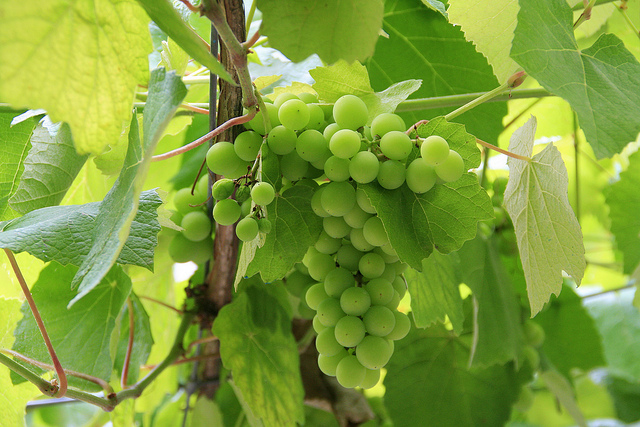 The six approved white grapes are, Albariño, Caiño Blanca, Godello, Loureira Blanca, Torrontés, and Treixadura, whilst the six red varieties meeting with approval are Brancellao, CaiñoTinto, Espadeiro, Loureira Tinta, Mencía and Sousón. All of the above mentioned grapes are grown by training them along granite parrales (poles) which ensures they are protected from humidity at the same time as making the most of them being in the sunshine. Overall, this wine producing region is the most well known of Galicia and accounts for the production of some of Spain’s most enjoyed white wines made from the Albarino grape. The fruity and fragrant wine is nearly always dry with at least 12 percent alcohol content. If you’re visiting Galicia and are interested in discovering the fine wines and seafood of the region then we can help arrange wine tours in English with a resident wine specialist. Various options exist ranging from one day excursions to a few of the main vineyards to week long self-drive tours of the region. Any group size can be catered for. This private tour begins in the city of Vigo where your driver will collect you. You will head south to visit a winery in the O Rosal Valley where you can try the exquisite Albariño wines. the tour then proceeds on to the beautiful village of Baiona before returning to Vigo.